What Are You Doing For World Accordion Day? Not Just OOM-PAH! Accordion Workshop and Concert on April 5-7, 2019. 2019 Waterway Village Zydeco & Crawfish Festival Features Accordionists! Welcome to the March 2019 USA news which contains important information including videos about upcoming accordion festivals, competitions, artists, and concerts. The start of the new year is often a time to review our services and plans for an exciting year ahead for AWW publications. 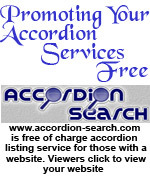 For that reason we thought it worthwhile to draw our readers attention to the About Accordions Worldwide page which is essentially our philosophy to positively promote the accordion. 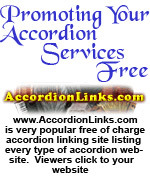 To provide a readily accessible information service about all aspects of the accordion, for accordionists, enthusiasts, accordion businesses and organizations. 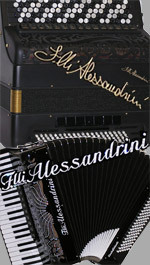 To encourage the general dissemination of accordion information and maintain a high level of service to accordionists. 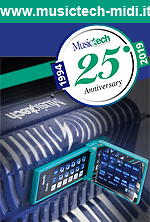 To benefit accordionists and accordion enthusiasts by effectively utilizing the advantages of modern technology. 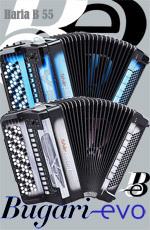 We aim to assist the future growth and popularity of the accordion worldwide. 5. ”Power of the Positive for Promotion". 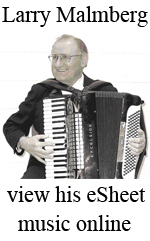 AWW publishes "positive" news for the general benefit of the accordion in accordance with the AWW "Aim". 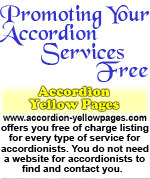 For full information please view the About Accordions Worldwide page. 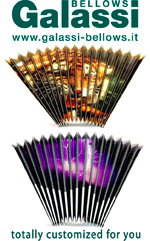 March is the time to prepare for summer vacations which include accordion events. 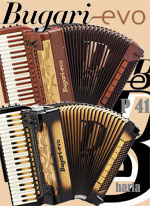 In this issue and future publications, you will read about fun, exciting, and important accordion festivals to either attend or participate in, perhaps both! 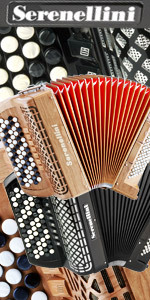 What are you doing for World Accordion Day (WAD) to promote the accordion in your country? 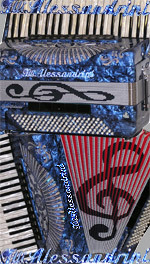 World Accordion day is on May 6th, which is the day the accordion was patented in 1829. Every association, group, orchestra, performer and teacher, is asked to actively support this event by encouraging national and local accordion activities to happen in their country on this day or the weekend either side of WAD if that should be more convenient. Accordionist and parody writer Weird Al won a 2019 Grammy on February 10, 2019 for Best Boxed or Special Limited Edition Package. He beat nominees Guns N' Roses and the Grateful Dead. “Weird Al” Yankovic now has the distinction of being the first recording artist with a Grammy Award for an album packaged inside an accordion! His career retrospective box set is called “Squeeze Box: The Complete Works of ‘Weird Al’ Yankovic”. 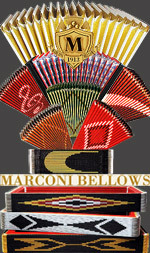 The collection packed all 14 of his studio albums, plus a 15th disc of rarities, into a container replicating the shape of one of his favorite accordions, each disc afforded its own slot within the expandable bellows. Two editions were created: one containing CDs, the other for 12-inch vinyl LPs. The 2019 NAA presents many concerts followed with informal playing sessions in numerous locations during the convention.Musicians, new media, and general public are encouraged to drop by to see the action on Wednesday. No Charge! Circle of Champions Show: After the Fun Band Concert, the Circle of Champions takes the stage and continues until 10:00 p.m. Together, the Thursday evening Fun Band and Circle activities has become an "ice breaker" event for the entire convention. This is a chance for many conventioneers to perform on the large stage and learn something about the other conventioneers. The pace of the convention is established during the Thursday activities day and evening. At 10:PM on Thursday, the scheduled events of the day are over and socializing and jam sessions start. For 2019, the New NAA Dance Band, Director Shelia Lee, has requested the Ballroom stage for a familiarity session with the music. Even if you do not plan to perform on the Friday Crazy Hat Dance Party, join this group anyway. The Arkansas Accordion Association will be joining this fun group on Thursday. The music can be found on the music page. Digital Suite: All conventioneers are encouraged to attend and participate (digital and/or acoustic) in the Ballroom activities.The Digital Suite will open after the concert. Friday, March 8, 2019 Bernstein & Bratkovich Crazy Hat Dance Party: Guest performers will be Eli Davidsohn, the New NAA Dance Band, Klugiewicz/Albreski Duo, Middleton, Rollie, and other conventioneers. Saturday, March 9, 2019 Gala Concert 7:30 - 10:PM. The NAA Symphonic Accordion Orchestra under the direction of Lionel Reekie (New Zealand) will open the Saturday evening Gala Concert. The Saturday evening Gala Concert consists of the various musical styles studied during the 2019 NAA Convention. After the concert, the Digital Suite will open for jam sessions, conversation, and other convention-related activities. Do not miss seeing and hearing your favorite accordionists during the 2019 NAA Convention! You will be happy you attended! The American Accordionists' Association (AAA) presents Festival 2019 from July 17 - 21 at the Valley Forge Casino Resort (Radisson Hotel) in King of Prussia, Pennsylvania. Mary Mancini, Vesna Mihonovic (guest conductor), Joseph A. Natoli, Rachel Quirbach, Dr Robert Young McMahan, sure to make the AAA Festival 2019 an exciting musical event. Other activities include: Workshops, Junior and Senior Festival Orchestras, Carrozza Scholarship, Youth involvement Jazz Ensemble. Accordionists & Teachers Guild, International (ATG) President Joe Natoli (picture right) invites all to the 79th Annual ATG Accordion Festival in Denver July 24-27, 2019. The event will feature concerts, workshops, competitions, exhibits, the ATG Festival Orchestra, Banquet and more! The 2019 Festival is the "Year of the Duos”. This year the ATG Festival will feature some of the best accordion duos around to provide double the fun, double the musicianship and double the entertainment. The 2019 festival will include the following featured : Jamie Maschler & Gabriel Rodrigues (Washington, USA); Augustinas Raukauskas & Greta Staponkutė (Lithuania); Kim and Dan Christian (Colorado, USA); John & Madalynn Neu with The Voice of the Wood Chamber Players (Colorado, USA). All accordionists attending the festival in Denver are invited to participate in the 2019 ATG Festival Orchestra. No matter what age or ability, there is a part for you! Renowned conductor and former ATG President Joan C. Sommers (picture right), Professor Emeritus at the University of Missouri-Kansas City will be directing the 2018 ATG Festival Orchestra. The Festival Orchestra will perform on the Saturday evening Gala Concert. Rehearsals will be held Thursday, Friday and Saturday to prepare for the concert performance. There will be several parts for the pieces being performed and most accordionists will find a part suitable for them. During the festival registration process, you will be able to sign up for the orchestra and provide your playing level. Contact Joan Sommers at joansommers@kc.rr.com if you have any questions. Additional information will be included in future publications. 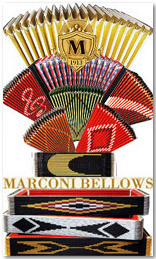 Presented by The New York Public Library for the Performing Arts at Lincoln Center: Reeds, keys, bellows or air… A vast universe of music, drawn from an accordion! Dr. William Schimmel kicks off a week-long accordion festival with an evening of eclectic, enchanting, amusing, and enraging accordion creations. From polka to punk; from Schubert to circus, Schimmel and friends will squeeze out every echo of accordion magic. Join them for the opening night a week-long celebration of the Library’s newly acquired William Schimmel archive. The date is April 1, 2019 6-7:30 PM. The late morning afternoon events each day will take place at the Vincent Astor Gallery and the April 1st evening event will take place at The Bruno Walter Auditorium - both at the library. All of the events are free. Reservations are necessary for Monday evening April 1 and the closing day April 6. The theme of each day and the participants are listed below. Join us in this exciting event. Day 1: April 1 - The Vincent Astor Gallery- Dr. William Schimmel, Curator, THE BUILT IN IRONIC DUALITY: Hip and Square, Elegant/Vulgar, Beautiful/Ugly, Old/New, Classy/Ain’t got no class. Participants include: 11 Am to 5:PM Nelson and The Wolf - Godfrey Nelson and Lorraine Nelson Wolf, David First, Will Holshouser, Melissa Elledge, Erica Marie Mancini, Dr. Denise Koncelik, Paul Stein and Dr. William Schimmel. 1. 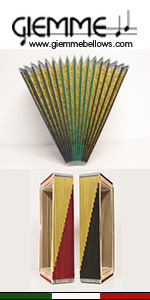 An installation by Dr. William Schimmel containing a collage of Accordion Books past and present,useful and useless, fun and questionable, educational, intellectual,smart and dumb. A Non Historical display of Accordions in the realm of today’s design issues in everyday usage. 2. A presentation of Videos directed by Micki Goodman - featuring Ms Goodman and Dr. Schimmel in every aspect of music and movement. Dr. Schimmel has performed with most of the major symphony orchestras in America, and many chamber music groups in New York. Pop star colleagues range from Sting to Tom Waits, who has commented, “Bill Schimmel doesn't play the accordion, he is the accordion”. His many accomplishments include founding the ‘Tango Project’, teaching, leading master classes, composing, recording, and performing on movie soundtracks. The Confédération Internationale des Accordéonistes (CIA) has awarded Dr. Schimmel the distinguished merit award for the AAA Master Class and Concert Series as well as his contribution to the international accordion scene. He received the American Accordionists' Association (AAA) Distinguished Service Award for Fifty Years of Accordion activity and his work as Lecturer in Residence. He is listed in Who's Who in America and Great Minds of the 21st Century. 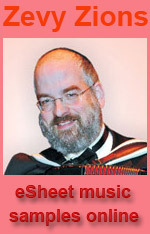 Dr. Wlliam Schimmel is a virtuoso accordionist, author, philosopher and composer. Excerpts from his website: He is one of the principle architects in the tango revival in America, the resurgence of the accordion and the philosophy of Musical Reality (composition with pre-existing music). He received his diploma from the Neupauer Conservatory of Music and his BM, MS and DMA degrees from the Juilliard School. 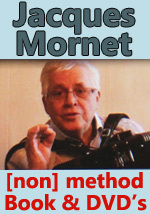 He has taught at the Juilliard School , Brooklyn College CUNY, Upsala College, New School University, Neupauer Conservatory (dean) and has lectured on accordion related subjects at Princeton , Columbia , Brandeis, University of Missouri , Duke University, Manhattan School of Music, the Graduate Center CUNY, Santa Clara University, The Janacek Conservatory in Ostrava, Czech Republic and at Microsoft. He is founder of the Tango Project, which, in addition to his hit recordings with them, has appeared with Al Pacino in the film: “Scent of a Woman”, for which Pacino won an Oscar. The Tango Project also won the Stereo Review Album of the Year Award, received a Grammy nomination and rose to number I on the Billboard Classical Charts. He can be heard in other films including True Lies, Kun Dun and many others including films that he both scored and performed and a series of films for the Nature Conservancy which have won numerous prizes in documentary categories. He is an authority of the music of Kurt Weill, having recorded all of Weill's music that employs the accordion.He is a prolific composer with many commissions from concert music to Broadway and off-Broadway. He has written countless accordion pieces for himself and others including a test piece for the Coupe Mondiale, the accordions' most prestigious world competition. His “Portrait No I” for orchestra was conducted by the late Leopold Stockowski. Dr. Schimmel, and his wife, choreographer, director, filmmaker Micki Goodman co-founded and co-direct the Institute for Private Studies, a pluralistic think-tank. They have one son, Michael, an accordionist and visual artist - and a Special Olympics gold medal winner. General Admission for-Accordion Mixology: Drink in the Essence of the Accordion is Free. Optional donation for the Library for the Performing Arts is appreciated. The NAA Board of Directors announces that New Zealand accordionist, educator and entertainer Lionel Reekie will direct the NAA symphonic orchestra in 2019. The NAA Convention takes place March 7-9, 2019 at the Hyatt Regency Hotel in Richardson,Texas. Lionel Reekie international accordionist with a beautiful tenor voice has performed in many countries of the world and he will perform solo and sing on two concerts and also the Final concert. Lionel Reekie was born in Rotorua, New Zealand. He began accordion lessons at the age of 9, and very quickly started to combine these skills with his love of singing. As an accordion entertainer, Lionel performed extensively around New Zealand from an early age, eventually being selected as a player in the Air New Zealand Accordion Orchestra for six of their international concert tours through Europe, USA and Asia. On these concert tours, Lionel was also a vocalist, performing a repertoire ranging from Light Opera to Rock and Roll. Lionel continues to perform regularly on accordion, as well as conducting accordion orchestras and teaching accordion at one of New Zealand’s largest music schools - the Music Education Centre. The Auckland Symphony Orchestra asked Lionel to appear as a solo vocalist for their “Last Night of the Proms” and this inspired Lionel to record an album of songs from Stage and Screen with an orchestra. After having travelled to Novosibirsk, Russia, with his family on several occasions, Lionel was so impressed by the excellent quality of Siberian musicians, that he chose to record his CD “From Russia With Love” in Novosibirsk in 2011. Released throughout New Zealand, and on iTunes, Lionel has been interviewed and featured on radio throughout the lcountry. Lionel's most recent trips to Russia were to perform in concert to a full house at the prestigious Novosibirsk Philharmonia in January 2013 and in September last year to featuring in the opening concert of the Coupe Mondiale in Rostov on Don. In August 2013, Lionel also performed as an invited soloist the American Accordionists' Association (AAA) 75th Anniversary celebration in New York City and then sang with the World Accordion Orchestra at the world championships being held in Victoria, B.C. Canada. Closer to home, his appearance at the Vector Arena for the Silver Scrolls also received a great deal of media publicity. Lionel was guest artist for the Australian International Championships Festival in Sydney in 2017 where he has also been a regular adjudicator and appeared in the USA at the AAA Festival in Washington DC in July 2018. Lionel was also a member of the international jury at the Harbin International Accordion Art week competition in China in August of the same year. I am looking forward to meeting all of you at the 2019 National Accordion Association Convention. Some of my fondest memories of the accordion come from the time I have spent making music with others. I am inviting you to join our symphonic accordion orchestra and make some great memories of your own. I have been lucky enough to conduct massed accordion orchestras for the South Pacific Accordion Championships (New Zealand) and the Australian International Championships Festival (Sydney, Australia) in the past and know that this type of experience cannot only be a lot of fun, but is also a super way to build your accordion skills in perhaps a different way from what you are used to. Just as with a real symphony all the parts are equally important – but don’t let that worry you – the great thing about playing in an orchestra is having others there to help you along! We have an exciting program with a variety of musical styles and I need a big group of keen and enthusiastic players! – Let’s work together to make this 2019 NAA Festival something really special." Joanne Darrow and the American Accordion Musicological Society present The 2019 AAMS Festival to be held on Friday March 15, 2019 from 6-9:PM and Saturday, March 16, from 10:AM to 10:PM at the Westmont United Methodist Church, Recreation Hall, 200 Emerald Ave, Westmont-Haddon Township, NJ. Each day includes fascinating and relevant workshops plus 3 Festival Orchestras. The three directors will be Dr Fawzi Habousche, Dee Langley, and Rachel Quirbach. The guest of honor/guest artist this year is Dee Langley (picture left). Dee Langley specializes in both solo and ensemble works for the accordion having appeared with the Minnesota Orchestra, St. Paul Chamber Orchestra, Duluth Symphony Orchestra, Ancia Quartet, Minnesota Sinfonia, Minnesota Philharmonic Orchestra, Nautilus Music Theater, Ethnic Dance Theatre and Flying Foot Forum. Ms. Langley is winner of the 2012 Minnesota Emerging Composer Award (Orkestar Bez Ime - World Music), the 2011-2012 McKnight Fellowship for Performing Musicians. Founder and coordinator for the NE Accordion Festival, she is also a former president of the Accordionists and Teachers Guild, International, currently on the Advisory Board of World of Accordions Museum and teaches accordion for Minneapolis Community and Technical College as well privately at her home in NE Minneapolis. On Saturday, March 16, at 7:PM, the Honoree Banquet takes place to give recognition to Dee Langley. Dr.Lou Persic, Anita and Bob Siarkowski will provide the music. The Gala Concert features Festival Orchestra 3 conducted by Dr, Fawzi Haboushe, Suzy Andres, Dallas Vietty and guest, Festival Orchestra 2 conducted by Dee Langley, Westment Accordion Club, and Joanna Darrow. IDEAS - Judging from the incredible growth and support from the entire international digital accordion community at all levels - it looks like this is an IDEA whose time has come! Joe Natoli and Michael Soloway, the co-founders of this new and unique organization will be performing and teaching at the NAA meeting in Dallas Texas beginning March 6, 2019. This will mark the first anniversary of the creation and public announcement of the society that embraces and fosters digital and electronic accordions as an instrumental art form in their own rite. Two years in the making, Joe and Michael brought out their concept for an independent digital/electronic accordion community just one year ago at the very same NAA meeting last year. Since then, the membership and involvement has continued to grow exponentially. Dialogue, discussion and playing unfolds daily on their face book page - GR8 IDEAS that surpassed 500 participants in less than a year and is expected to go over a thousand by the end of the year. IDEAS SYMPOSIUM I was held in Ohio last November 2018 with participation from all over the globe and was so exciting and successful that SYMPOSIUM II, Nov. 6—10, 2019 will begin registration next month at the NAA meeting. Requests are coming in already as Joe and Michael work to keep up with all of the interest as the international digital accordion community is finally finding its “home”. The new IDEAS website is undergoing construction and will be unveiled soon. WWW.GR8IDEAS.ORG with public and also private members sections. In the meantime, until the first anniversary at the NAA, annual memberships in IDEAS are being offered at $40 instead of the regular $60. To join in, just email the group at THEGR8.IDEAS@GMAIL.COM and request the membership. Remember the annual discount will end after the NAA meeting on March 10, 2019. Jazz accordionist Eddie Monteiro (New Jersey,USA) will present a workshop at the 2019 NAA Convention in Texas March 6-9, 2019, "Harmonizing The American Songbook" on March 9, 2019 at 10:AM. Eddie Monteiro will show how to find alternate chord changes to enhance performance. This will provide you some basic keyboard theory and will help you building harmonies and beginners tips on improvisation. Eddie Monteiro is an internationally recognized musician and educator with 30 years of musical performance in classical, jazz, dance, theater, cabaret and choral ensembles. He is well known for his harmonic skills and talent. He won many accordion championships as a youth and was also the youngest honoree elected to the American Accordionist’s Hall of Fame. The musician recently returned from Italy where he was performing and teaching. Eddie is also the youngest honoree elected to American Accordionists’ Association Hall of Fame, November 1994. Member of Bobb Rosengarden, Skitch Henderson, Peter Duchin, Ray Bloch, Michael Lanin and Marty Ames, orchestras from 1971 to present, performing in the New York Metropolitan area and worldwide. Featured member of the pit orchestra on stage in Broadway revival performance of "Carnival" and "Evita" and recording of radio and television jingles for Sesame Street, General Foods, Colgate Palmolive, Anheuser-Busch, AT&T, Bennigan’s Restaurants, Pontiac and more. Lead artist of innumerable society bands performing throughout the world at social events, political gatherings and corporation conventions. Eddie recently retired as the Music Teacher, Choral Director, Vocal and Instrumental Music Director for the Ann Street Elementary School. Eddie Monteiro has performed at Jazz Festivals throughout the world. National performances include the JVC Jazz Festival and the Toyota Jazz Festival in New York City, Salishan Jazz Festival and the Centrum Jazz Festival both in Washington. Internationally Eddie was a guest at the North Sea Jazz Festival in Holland, the Jakarta Jazz Festival in Indonesia, Sea Jazz Festival in Helsinki, the Norwegian National Accordion Competition, Sweden's Annual Accordion Festival in Ransatter and in January of 2000 Eddie closed the Jazz In El Tambo Festival in Punta del Esta, Uruguay performing with Paquito D'Rivera, Leny Andrade, John Patitucci and Benny Golson. He has conducted workshops and seminars at the Manhattan School of Music, Kansas City Jazz Workshop, Artists in Jazz at Pace University, Topeka Jazz Workshop and a Harmony & Improvisation Clinic in Norway. His numerous recordings include Double Standards, The Real Thing, A Perfect Match (with Nancy Marano featuring Gerry Mulligan, Roger Kellaway and Claudio Roditi), Under Paris Skies (with Karen Akers), A Walk on the Wilde Side (with Ronny Whyte), Jazz Influence and Arkadia Jazz All Stars: Thank You John! (a tribute to John Coltrane) and was featured on the album with the vocal group ‘String Of Pearls’. His work has also included numerous jingles for Colgate-Palmolive, Budweiser, General Motors, Folonari Wines, General Foods a soundtrack recording with Marvin Hamlisch and an appearance on film ‘Mortal Thoughts’ with Bruce Willis. A graduate of NYU with a B.S. in Theory and Composition and Music Education, Eddie studied accordion with Charles Nunzio, (one of the founding members of the American Accordionists’ Association), piano with Madame Olga Van Till and advanced harmony studies with Marty Holmes.Eddie is a member of the AAA Governing Board and is a Certified Teacher Member of AAA as well as a member of Music Educators' National Conference, National Academy of Recording Arts and Sciences, Technology Institute for Music Educators, National Education Association, Jazz Educators Association the Sommelier Institute and is an Amateur Radio General Class Operator. Aboard the Norwegian Escape 7-Day Bermuda from New York, May 12-19, 2019. Amazing entertainment with fantastic music and Broadway Shows will be there for your enjoyment too!! Joanie Madden, Cherish The Ladies, Sharon Shannon, Lúnasa, Makem & Clancy, Johnny McEvoy, Don Stiffe, Ennis Sisters, Tommy Sands, Daoirí Farrell, Padraig Allen & The McLean Ave, Arty McGlynn & Nollaig Casey, Máirtín de Cógáin, Eddi Reader, Phil Cunningham, Gabriel Donohue, Kate Purcell, Billy McComiskey, Dylan Foley, Joshua Dukes, Pride of Moyvane Ceili Band, Sean Fleming, Mirella Murray, Kathleen Boyle, Mary Coogan, Cormac De Barra, John Nolan, Donnchadh Gough, Kevin McHugh, Tony Corbett, Bruce Foley, Pat Shortt, Pat Kane & Terry Kane, Patrick & Conor O’Sulliv, Fr. John Griffin, Donny Golden, Cara Butler, Jon Pilatzke, Michael Boyle, Gerry Timlin, Padraig and Roisin McEneany, Paul Keating, Marianne MacDonald. Alex Meixner enthusiastically contributes: “The whole band (Tom, Chris, Jimmy, and Paddy) will be loading up this week for our first Texas trip of the year! We’re going back to historic Sefcik Hall on Saturday, March 2, 2019 in Seaton, TX for a one-night polka dance. This is one of those places that just has a homey vibe in the walls. Grab your dancing shoes and be ready to party! Sunday, March 3, 2019 brings us down to El Campo for the first time with the band. We’ll be benefiting the High School Band program and are excited to have fun with students, parents, grandparents and anyone else who wanders in! I’ll be teaching at the school in El Campo on Monday and then getting set for our Annual Fat Tuesday concert at the Brauntex Theatre in New Braunfels. We have some special guests which will be announced soon. I assure you, this is a special place to catch the band in top form, so make sure you grab those tickets!! Alex began to learn how to play the accordion at age four. He presently owns 14 accordions and travels extensively with his band (AMB). Meixner says he loves how the accordion always gets a crowd reaction. Alex Meixner’s performing career began at age 6 with his two sisters and father in an ethnic folk ensemble. Excerpts from his website: From these early experiences through headline appearances at music festivals throughout the US; concert performances with the London Symphony Orchestra, Sandy Duncan and his own jazz and ethnic ensembles ensembles. Meixner has developed a unique musical mix that appeals to a wide cross-section of audiences. Meixner’s formative musical studies were on piano and piano accordion, but he quickly branched out on drums, diatonic button accordion, bass and trumpet, his college major. This instrumental versatility is combined with a musical background that has included intense studies and performance of jazz, classical, pop, polkas and many ethnic folk music genres with some of the leading artists in the world. His talents in music and comedy were even featured on the Tonight Show on NBC. His “Polka Freak Out” CD with Bubba Hernandez garnered a Grammy nomination in December 2007.Currently based in Palm City, FL, Alex is performing as a solo artist and with numerous touring ensembles. In 2016 Alex collaborated with the notable advertising agency, BBDO, to produce the infamous Hormel Pepperoni commercials contributing to a successful sales campaign and contract renewals. At the end of 2016, he recorded with comedy phenomenon, Jack Black, for the major motion picture, ”The Polka King, ” that premiered at the Sundance Film Festival in 2017. Alex’s reputation for professionalism and quality performance attracted additional commercial opportunities including performing on radio commercials for Ford Trucks and the soundtracks for numerous episodes of Moonshiners on the Discovery Network. Alex has performed on over 50 albums, including 17 as a leader or soloist. His performance with his Father on Canadian Polka King, Walter Ostanek’s, “Music and Friends” won a Grammy Award. His album Polka Freak Out, a collaboration with Bubba Hernandez, was nominated for a Grammy Award in 2007. He has also recorded with a vast number of diverse artists as a soloist or sideman including avant-garde accordionist/ composer- Guy Klucevsek, Grammy winners- Brave Combo, TexMex Rock icons- The Krayolas and Irish entertainer- Seamus Kennedy. His latest recording as a leader is “You Asked for It!”, a live concert DVD and CD of The Alex Meixner Band released in 2016. Winsted, Conn., February 15, 2019 – Angelo Paul Ramunni of Canaan, Conn., author of his recently-published book “Accordion Stories From The Heart”, will present a book signing and mini-concert hosted by Rowley Grill & Tap at 19 Rowley Street in Winsted, Conn., on Sunday, March 10, from 2:00 to 3:PM. Founder of the New England Accordion Connection and Museum Co.in Canaan, Conn., Mr.Ramunni will share stories from his new book. 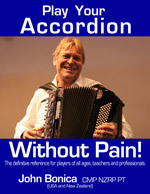 He will also perform a number of accordion songs, and answer questions from attendees. Books will be available for purchase along with the author’s autograph before and after the mini-concert. The event is free and no reservations are required. Mr. Ramunni’s privately-operated "New England Accordion Connection & Museum Company" showcases over 500+ stunningly beautiful accordions plus a studio where he repairs, buys and sells remarkable hand-crafted accordions. He also offers for sale over 10,000 pieces of sheet music and accordion-related books. 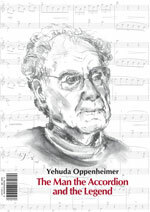 “Accordion Stories From The Heart” is filled with very personal and easily-read, in large print, accordion stories. The book’s retail price is $39.95 and it is sold through http://www.Amazon.com and at https://www.barnesandnoble.com. 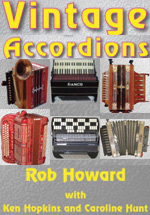 Autographed copies of the book can be purchased at the March 10 book signing and mini-concert at Rowley Grill & Tap or by calling the New England Accordion Connection & Museum Company at 860-833-1374 or visiting https://www.neacmc.com. Admission is free to the event. No reservations are necessary but seating is limited. Rowley Grill & Tap is located at 19 Rowley Street in Winston. Phone: 860-238-4999. Caption: “Accordion Stories From the Heart” author Paul Ramunni will offer a free book signing and mini-concert Sunday, March 10 2:00 to 3:00 PM at Rowley Grill & Tap at 19 Rowley Street in Winsted, Conn.
Video 1: Creosote, Jamie Maschler and Gabe Hall-Rodrigues play Snarky Puppy's “Semente” off the Culcha Volcha Record at Petosa Accordions in Seattle, WA. Video 2: Performing at the Accordionaires Club of Los Angeles with Sinclair Lott on drums and Mike Gurrola on Bass. Creosote musicians Jamie Machler and Gabe Hall-Rodrigues and Los Angeles based jazz accordionist Frank Petrilli will perform at the MoMM on March 22, 2019. Frank Petrilli is highly active in both the accordion and wider jazz communities on the West Coast, and throughout the US. A protégé and close friend of the late great jazz accordionist Frank Morocco, Frank has performed with renowned artists such as guitarist John Chiodini at top venues such as “Herb Albert’s” Vibrato’s Grill and Jazz. Creosote is the accordion duo of Jamie Maschler and Gabriel Hall-Rodrigues. Together they play a dynamic array of original and world music. Maschler and Rodrigues are both seasoned musicians and have individually and collectively mastered their craft of performing, arranging and composing on the accordion. Expect to hear clever yet elegant versions of new and old Brazilian and world music tunes. The instrumental duo recently released their first self-titled digital album, "Creosote"
Funded in part by the City of Carlsbad Cultural Arts Office. Did you ever look at people walking down the street by themselves? Are they really alone? Or, are they talking on their cellphones as they walk through the city.? The American Academy of Orthopaedic Surgeons (AAOS) says,” What about distracted walking? What are the consequences of pedestrians talking on the phone, texting, listening to music, or engaging deeply in conversation with the person next to them? Today, more and more people are falling down stairs, tripping over curbs and other streetscapes and, in many instances, stepping into traffic, causing cuts, bruises, sprains, and fractures," said Alan Hilibrand, MD, chair of the AAOS Communications Cabinet. "In fact, the number of injuries to pedestrians using their phones has more than doubled since 2004, and surveys have shown that 60% of pedestrians are distracted by other activities while walking." Excerpts from the article on “Distracted Walking” on the AAOS website: To learn more about the perceptions and behaviors associated with distracted walking, AAOS commissioned a Distracted Walking Study in 2015. The study involved 2,000 respondents nationally, and another 500 respondents in each of the following eight cities: New York, Los Angeles, Chicago, Philadelphia, Houston, Phoenix, Atlanta and Seattle. How is this related to practicing your instrument? I see a direct correlation. I believe that focused attention on practicing can be enhanced by walking without devices. How? When you are walking WITHOUT your cellphone or devices, you are actually forced to be in your own company, to be solitary with your thoughts, to tolerate your own company, to enjoy nature or just see the sights around you. How many of you can do that on a regular basis? If you can do this for, let’s say, a half hour, then, perhaps, you can also sit alone to practice your instrument for a quality practice session. Sitting in a room, alone, paying attention to the music and the technique of your instrument is the only way to learn and improve. It may be more difficult for you because, if you think about it, when are you ever really alone and focused on working on a skill? If you can’t even walk down the street, or in the park, or sit quietly on your deck by yourself, then, how can you truly and happily focus on practicing your instrument? I thought of all this today while walking in NYC today (yes, without my cell phone). I noticed over 75% (my guesstimate) of people were either talking on their cell phones or listening to something. Even babies!!! Would you believe that children in strollers have cell phones to watch videos? What about looking at the trees, or cars, or people around them? Even the nannies and parents pushing the strollers are on their devices! I am proposing a challenge: Try taking a walk each day for half an hour alone without devices. Then, see how your practice time not only improves, but increases and is more productive. I am practicing what I preach and I find my own attention span increasing. Keep a record of your practice times and see how a daily solitary walk enhances your performance. They are available to play private parties, large festivals and everything else in between. Pablo De Vincenzo was born and raised in an Italian family, watching his father playing the “riganetto”. At 9 he started studying the accordion and at 17 he starts playing professionally. Since then, he plays every week in family and corporate events. In 2012 he opened his accordion dealer and repair shop in Miami, FL. 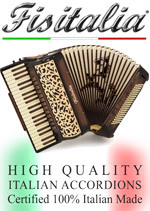 representing the well known Scandalli brand; now he is one of the few legal and formal stablished accordions dealer and repair shop in the United States, selling new and used high-quality accordions, for students, amateurs and professional players. Shirley Johnson and Laura Jean Niland are offering their 2019 Not Just OOM-PAH! Accordion Workshop and Concert on April 5-7, 2019. This project is supported in part by the Cultural Arts Division of the City of Austin Economic Development Department, with addition support form Texas Folklife and Central Market in Austin, and the San Antonio Accordion Association. The FREE Concert will be on Friday, April 5, 2019 @ 6:30-9:00 PM at Central Market North, 4001 Lamar Blvd, Austin, TX 78756, featuring accordionists Jamie Maschler & Friends playing Forro and Latin Styles, and Rachel Bell with Karen Axelrod playing French, Celtic and English Folk Dance Music. A series of 12 workshops plus a Folk Dance Session will be held on Saturday-Sunday, April 6-7, 2019 from 8:30 AM - 5:30 PM at Lamar Senior Activity Center, 2874 Shoal Crest Ave., Austin, TX 78705. Also on Sunday April 7 from 2-4 PM there will be a Folk Dance Session FREE and open to the public @ Lamar Senior Activity Center with music provided by Rachel Bell & Karen Axelrod, and dance instruction by Gaby Thompson. Hotel information is in the Registration Packet, for out of town guests, or call for details. The cost for the workshops for accordionists is $175 to include all materials and lunch on each day, $60 for non-accordionists includes lunch each day. In addition, one scholarship will be offered to a young accordionist under age 18. Registration is limited to 30 participants for workshops, with deadline for Registration March 15, 2019. The deadline for Youth Scholarship Award application is March 1, 2019. Extracts from eternal French songs by the duet Jac & Co.
Compilation live duo JAC & CO @ Paris Bistro - Philadelphia, 30 April 2017 during the 4th US East Coast Jac & Co Tour 2017. Formed in Savoie, France, the band Jac & Co is composed of Corinne and Jacques Pellarin, a French married duo. Their eclectic music repertoire, made of French classics songs (Edith Piaf, Yves Montand, Charles Aznavour, Juliette Gréco, Charles Trenet, Dalida, etc), many international songs (Cole Porter, Pink Martini, etc), evocations of soundtracks (« Un Homme, une Femme », etc) or Jacques Pellarin’s originals compositions (tango, Latin music, gypsy music, French songs and Paris, etc) has led them to several tours in USA and UK, but also to many concerts in France and Switzerland. With only voice and accordion, Jac & Co captivate audiences and transport them to the dance-halls and street side cafés of France’s yesteryears. Jacques recently recorded two new Masterings for NHK TV - Japan ! "Resistango" & "Melody of the Day" by Jacques Pellarin. The music has been included in a national documentary as "Song titles", June 16th 2018 and is also available in the NHK Music catalogue. Accordionist Dan Newton (Daddy Squeeze) has a busy spring schedule appearing with Pat Donohue and the Prairie All Stars at the Chatfield Center for the Arts this Saturday, March 2, Chatfield, MN. Dan performs in many groups in the Minneapolis area. Excerpts from his website: Dan “Daddy Squeeze” Newton has been dazzling audiences with his creative accordion style for over 30 years. His fresh approach to theaccordion and his mind-boggling repertoire of both original and traditional material will change the mind of the most hardened accordion skeptic. Dan draws influences for songs and tunes from such sources as French Musette, Gypsy Swing, Cajun, Jug band, Tex-Mex and Cumbia. He calls this global gumbo “ethnoclectic” music. Daddy Squeeze entertains and also enlightens his audiences with stories and colorful anecdotes about the accordion and his experiences while making a living playing the instrument he loves. Dan has produced more than 25 albums for himself, his band, and other performers. He has appeared on recordings by other artists such as Garrison Keillor, Son Volt, The Proclaimers, Peter Ostroushko, Prudence Johnson and Pat Donohue. His music was featured for one season on MTV's series The Real World: Paris. Dan has performed at the Lincoln Center, NY, Kennedy Center, Washington DC, Accordion Festivals in Vienna, Austria, San Antonio, TX and Cotati, CA, Bastille Days in Milwaukee, WI, Kaustinen Folk Festival in Finland and the Winnipeg Folk Festival. He was also a frequent guest on the Garrison Keillor’s radio show A Prairie Home Companion. Dan spends much of his time playing accordion with his group Café Accordion Orchestra, performing Vintage Swing, Latin, American, and French Café music. He leads a number of other bands including; Jumbo Ya Ya, The Rockin’ Pinecones, The Hula Peppers, and The Daddy Squeeze Band. 4 gigs and a "heads up" to tell you about! Heads up: New Loring schedule! Dan Newton's Cafe Accordion Orchestra will play only the FIRST TUESDAY of the month at the Loring starting March 5. There will be no trio appearances on the other Tuesdays, but there will still be room to dance and the $30 dinner-for-two special when CAO is there. CAO has some other Tuesday performances lined up, including March 19 and April 16 at Vieux Carre, and another "Midnight in Paris" show at Crooners on June 18. March 3, Sunday 8-10:PM: Honky Tonk Jump at the Aster Cafe, Mpls. Join HTJ for an evening of Western Swing and Classic Honky Tonk on the Minneapolis riverfront. The Aster Cafe is on 125 SE Main St, Mpls. Accordionist Dallas Viette and guitarist Lisa Liu will perform on April 12, 2019 at 8:PM at Sandy Spring Museum, 17901 Bentley Road, Sandy Spring, MD 20860 Tickets are $20. The museum’s intimate Dr. Bird Room provides a cozy and relaxing setting. Dallas Vietty is a well known accordionist in the USA. Lisa Liu is an incredibly accomplished guitarist. For one night only, they are bringing Gypsy Jazz to Sandy Spring. This style of music exploded on the scene in the 1930s with the help of famed European guitarist Django Reinhardt. Dallas’s unique sound is heavily influenced by both Gypsy and American jazz. He has performed at some of the top US festivals, including TEDx Philly and Djangoary Festival, and has played iconic venues including The Iridium NYC and BB King’s Time Square. Award-winning accordionist Dallas Vietty is an in-demand accordionists performing jazz and swing in the United States today. Excerpts from his website: Dallas’ unique style comes from his background in the American jazz tradition, as well as study and immersion in the European swing tradition of Django Reinhardt (Gypsy Jazz) and French accordionists. As band leader of two groups (Hot Bijouxx and Musette Project) Dallas remains very active on the East Coast concert and festival scene. His groups have performed at some of the top U.S. festivals including: TEDx Philly, Djangoary Festival. As a sideman his performances have taken him to legendary venues like: The Iridium NYC, BB King’s Time Square, Dizzy's Club at Lincoln Center, and the Philadelphia Kimmel Center. Growing up in Southern California’s Mojave Desert, Dallas showed a proclivity for music at a young age. He began as a jazz pianist, starting private instruction at 12, and spent several summers at the famous Idyllwild Summer School for the Arts. At California State University Northridge, Dallas pursued Jazz Studies, and performed throughout the LA metro area, Hawaii, and Japan. But piano was soon superseded by a passion for accordion. Dallas moved to the East Coast and fortified his independent education at New Jersey’s Acme Accordion School, studying fundamental technique and Free Bass education. Lisa fell in love with guitar at age 13 and knew early on that she wanted to study the art of jazz. When asked who is her greatest jazz influence, she said, “Ella Fitzgerald was a huge influence on me when I first heard her as a kid. There is something so genuine and familiar about her. Django Reinhardt really opened up the door to a whole new world for me. I love the sound of an acoustic guitar playing jazz! I can listen to and watch Martin Taylor play all day long; he's so lyrical.” Lisa is an Artist Ambassador for the Santa Cruz Guitar Company and was accepted to be an Artist in Residence at The Robert Rauschenberg Foundation. An introduction and demonstration in enhancing your simple Fakebook lead sheet songs. Paul will distribute a handout of pre-chosen song sheets. Each sheet will contain the original Facebook version together with a more enhanced version. Each enhanced version is meant to contain variations, ideas and musical concepts which Paul has acquired from his years of experience and performance. The enhanced lead sheet versions range from simple to semi-advanced. Paul will explain the apprentice method of learning where the student is personally handed the artistic craft of musical creativity from a master artist. He will demonstrate some of the musical concepts and song enhancements shown in the handout. You will learn some of those things he has learned along the way and how you can incorporate them into your playing too. You can take the song sheets home for practice and learning. The goal of the workshop is to show and tell some of the tips which we have all heard but never quite understood. * Originally from Chicago, Paul Betken performed all over the Chicago-land metro area for many years. Now, residing in Tempe, AZ for the last 13 years, he enjoys casual engagements and jam sessions all around town. Paul keeps active performing at local music venues, national events and festivals. Select clips of his performances are also available on YouTube. Paul's past concert appearances include the Las Vegas International Accordion Convention 2010, 2012, 2013, 2015 and 2018; Florida Smash, Southeast Accordion Association, Orlando, Florida, November, 2012; Cotati Accordion Festival, Cotati, CA, August, 2014; Cotati Accordion Scholarship Concert, Redwood Café, Cotati, CA, August, 2015, 2017 and 2018; National Accordion Association Convention Concert, Dallas, 2014; 2015; 2018; 78th ATG Festival, Lisle, Illinois, 2017. He participated in the Mesa Accordion Event 2012, 2013, and 2014; 1st Runner-up, Senior Division, Roland Accordion Festival Competition (2012); the “Jazz Series” at Sacred Grounds, Phoenix, AZ, “A Tribute to Leon Sash” July 2012; the Opa Life Cafe Jazz Series, Tempe, Arizona, 2016 to present and THE NASH, Phoenix, Arizona, November 4, 2018. Paul has played in concert for many accordion organizations including the North Hollywood, CA Accordion Club, July 2012; Silicon Valley Accordion Club, San Jose, CA, January, 2015, the Chicago Accordion Club, Elmhurst, Illinois, July, 2017 and the Arizona Accordion Club. 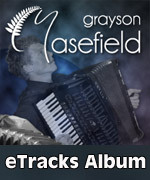 Publications include: "Jazz Accordion Arrangements" with CD.CD releases: “PAUL’S TURN – JAZZ ACCORDION” “BEYOND MY COMFORT ZONE – ECLECTIC JAZZ ACCORDION” Available on CD Baby. 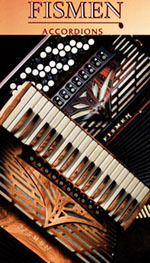 La Villini Restaurant of East Northport, NY is sponsoring the next meeting of the Long Island Accordion Alliance (LIAA) on Wednesday, March 6, 2019 at 6:PM. The featured guest artists will be accordionist Mario Tacca and international vocalist Mary Mancini. Mario Tacca, on the Board of Directors of the AAA, was born in Italy. During his childhood, his family moved to the Alsace Lorraine region of France where he began his musical studies. This is where his love and intense desire to play the accordion began. He loved the sound! He would pick up the accordion and imitate some of the songs his mother used to sing. The desire and love never diminished, despite having to walk three miles weekly to his teacher with his instrument strapped to his back! While in France, he was the winner of many regional and national accordion competitions. He went on to become a world champion, winning the World Cup of Italy, the Grand Prix of Paris, the US National Competition and the International Accordion competition held at Carnegie Hall in New York City. Mario Tacca dazzles audiences across the US and around the world with his outstanding virtuosity and his exciting interpretations of international music, the classics and pop. Mario has recently been seen on MTV in a commercial for a pilot Italian Food program. Also, he was seen on the Food Network in a commercial for “Throwdown with Bobby Flay.” His latest recording, “Journey Through the Classics” features great melodies from the Classic Repertoire. Mary has headlined numerous concert halls and festivals in North America, Europe, and China. She has performed at the Garden State Arts Center, Resorts International Casino Hotel, Taj Mahal in Atlantic City, and Mohegan Sun Resort Casino in CT.
As a dynamic and popular performing duo, they have completed two concert tours of China. As guests of the China Ministry of Culture, they toured five cities in three weeks and performed with three symphony orchestras. Joining them on their tour was highly acclaimed Chinese tenor, Douglas Song. In addition to performing with the Symphony Orchestras, some of the most memorable moments included a performance held at the 1600 seat True Color Jazz Supper Club in the booming city of Shenzhen and in the 3500 seat Golden Opera House. In addition to their busy performance schedule, Mary and Mario have recorded 10 CD's between them. The Long Island Accordion Alliance (LIAA) meets the first Wednesday of the month at La Villini Restaurant, 288 Larkfield Road, East Northport, NY 11731 (631.261.6344) and is in its eighth year of bringing accordion music to the Long Island community. The 57th Annual New England Music Festival will be held from April 5-7th 2019 at the Boston Marriott Newton, Newton, Ma. The New England Music Festival is an annual musical competition sponsored by the Accordion Teachers Association of Massachusetts, Inc, (ATAM). The festival averages more than 3000 entries and 800 contestants from all across New England. The Leavenworth International Accordion Celebration (LIAC) takes place from June 20-23, 2019. Excerpts from the website: The Northwest Accordion Society has been hosting accordion events in the Northwest for over 25 years. 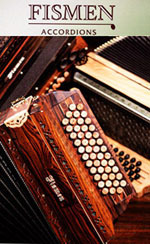 Included in it's accomplishments are monthly accordion socials, the annual "Day of the Accordion" at the Seattle Center and accordion scholarships. Leavenworth is Washington’s “Bavarian Village” and a perfect setting for this celebration. Nestled in a cozy narrow valley at elevation of 1100 feet surrounded by wilderness of rugged, majestic mountain ranges, over 2 million visitors per year from all over the world come to experience magical Leavenworth. With the Northwest Accordion Society as your host and Leavenworth as the setting, why not plan to join us and enjoy four wonderful days of everything accordion. Whether you are a competitor, participant or just love great accordion music, there is enjoyment and participation for everyone. * Jam sessions and much more! 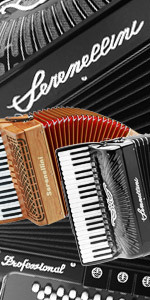 This is a celebration of the accordion’s versatility and its presence in many cultures. Accordion music is what this event is all about. See Doris Osgood’s link to “It’s Time to Prepare for Leavenworth” The 26th anniversary of the Leavenworth Accordion Celebration looks to be one of the best events ever. Note the outstanding line up of professional performers.The variety of music will showcase the versatility of the accordion. The Connecticut Accordion Association and the American Accordionists' Association (AAA) proudly present "Remembering a Legend ................ Charles Magnante"
New York City based accordionist Victor Prieto will present his VI Jazz Accordion and Modern Harmony Master Classes in Ourense, Spain on July 13 and 14, 2019. Registration/Audition is officially open. There are 9 places, no inscription fee, meals and accommodations are complimentary to all the 9 attendees. If you would like to participate please send a video recording just playing alone or with your group to info@victorprieto.net You will be notified if you have been selected to participate in the Master Classes in April.You will receive information about transportation, hotels and lodging. If you have any question please write to the organization office. The Master Classes will be held on 14th -15th of July, 2019 and will take place at Centro Cuntural Marcos Varcarcel in Odense, Spain. The Master Class will last for 10 hours distributed as follows: 3 hours in the morning and two hours in the afternoon each day. The classes will run from 10:30 to 13:30 and 15:30 to 17:30. The lunch break will be from 13:30 to 15:30. The Master Class will be entirely in English. Victor will translate to Spanish in case as needed as in past years. Jam sessions: July 13th during the night, there will be an open Jam session at a great Jazz Club of the city "Cafe Cultural Auriense", so all the participants can play with other instruments, experiment, socialize and have a wonderful time performing in front of an audience. -Full rhythm section (bass and drums) both days. -Comping: How to form chords, close position, open position, Upper structures. Poly-Chords: My technique "Chord Approach on both hands." - Styles: How to frase and comp: Jazz, blues, Brazilian, traditional tango, new Tango and other styles of modern harmony. -How to work and what to do in a recording studio when you get only chord changes. 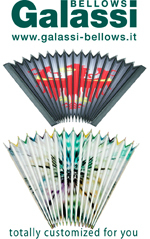 - A book with material will be given to each student for further studies and review (to take home with you). - We will practice and perform with a rhythm section (bass and drums) so everyone can apply all the information that we have gone over. - How to use the registers and voices of the accordion to orchestrate and and have a bigger variety of colors and sounds. Contact the organizers at: Phone 34-665-629-110. 2019 Waterway Village Zydeco & Crawfish Festival & 5K Run takes place on Saturday, Apr 20, 2019 from10:00 AM to 6:00 PM. The annual Waterway Village Zydeco & Crawfish Festival (free admission) boils up a beaucoup (French for a lot) of fun! Eat great food and dance to the infectious rhythms of some of the best Zydeco bands from around the South. There will be arts and crafts vendors as well as children's activities offering nonstop fun for all ages.If that's not enough, work up an appetite with the 5K Run/1 Mile Fun Run and Laissez les bons temps rouler (let the good times roll) all day long. Zydeco groups including accordionists include: Rusty Metoyer & Zydeco Krush, Excelsior, Lil Nate and the Zydeco Big Timers, Dwayne Dopsie & the Zydeco Hellraisers , Chubby Carrier. and Step Rideau.